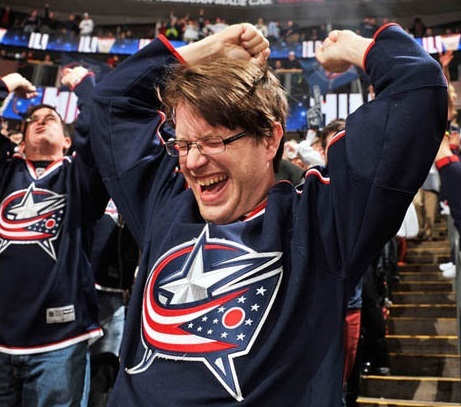 Dirty Dangle Hockey: Cheering for Columbus? Last night I was flipping back and forth watching different games and found myself catching most of the 3rd period of the Blue Jackets and Avalanche game. My main reason was to see if Sergei Bobrovksy was going to get my fantasy team a win, but after the Blue Jackets tied the game up late and won the game in overtime I started thinking that I want this team in the playoffs. 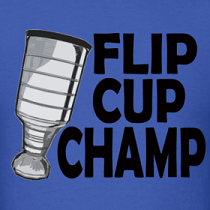 The Columbus Blue Jackets have been pretty much a joke of an organization since they came into the league in 2000. The franchise has only made the playoffs once back in 2009 and they were swept in 4 games, so as an organization they have yet to win one single meaningful game. Well, something has changed. Maybe it's their ridiculous Russian goalie, their new Finnish GM, or it could just be their ice girls. Whatever it is, you can now add me to the list of people that would like to see them actually win a playoff game. I'll be honest, it's probably Bobrovsky who was dropped by a GM in my fantasy league early into the season that has me loving on Columbus. He has singly-handedly saved my team with his 2.03 goals against average, .931% save percentage and 4 shutouts. His name is being tossed around in Vezina Trophy talk, and if he maintains his play he should be a lock. Among all goaltenders with 30+ starts, Bobrovsky leads them all in save percentage and goals against average. For a Columbus Blue Jacket goaltender, that is incredible. But there's something else about this team. How they play and how they just never quit and leave it all out there on the line. A team led in scoring by 38-year-old veteran, Vinny Prospal, with 27 points in 43 games and a cast of role players like RJ Umberger, Brandon Dubinsky and Mark Letestu mixed in with younger talent such as Ryan Johansen, Matt Calvert and Cam Atkinson. They're a ragtag group of players nobody seemed to want or gave any credit to as legitimate NHLers. The team didn't have any marquee players this season that would have fans running out to buy their sweaters thanks to Rick Nash's depature in the offseason, but that changed when they made a big splash at the deadline to grab Marian Gaborik from the Rangers. Gaborik has since put up 6 points in 7 games since being a Blue Jacket and should help them score down the stretch. 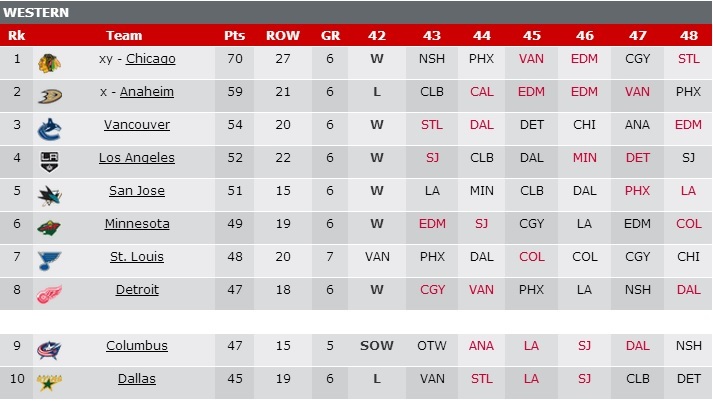 Glancing at the Western Conference standings the Blue Jackets still have a chance to sneak into the playoffs, but they need to keep on winning. 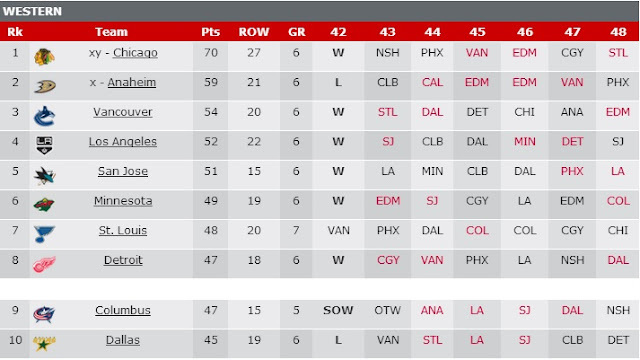 They have won 4 straight and won 7 of the last 10 and sit tied with the Detroit Red Wings for 8th spot with 47 points. But with just 5 games remaining they'll be in tough with more games played and less Regulation or Overtime Wins for the tiebreaker. They also face some tough opposition in a tough road swing in California before finishing the season against Dallas and Nashville. Anything could happen in the next two weeks and it should be an exciting last few games to the NHL season if the Blue Jackets can keep their winning streak going. There is noway the Blue Jackets knock my Red Wings out of the playoffs this year boys.